For use with HM Digital's ORP-200 (as well as other brands of ORP meters). Always make sure your sensor is kept in an electrode storage solution. 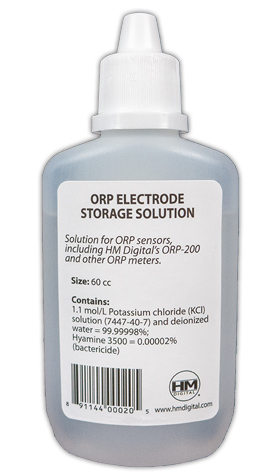 If dry, refill the ORP meter cap with the ORP-STOR storage solution. The sponge should be moist (not soaking wet). NOT FOR CALIBRATION. To calibrate, use ORP buffers. PLEASE NOTE: For best performance and testing results, ORP meters should be regularly calibrated and cleaned. Please consult your user's guide for calibration and cleaning instructions, or contact HM Digital.